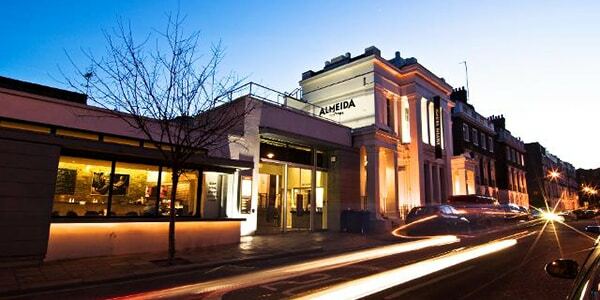 Originally conceived in 1978 within a derelict Salvation Army Hall, the Almeida Theatre was founded in 1980 and opened with a festival featuring music and avant-garde theatre. This brand of theatre was regularly hosted alongside fringe productions, touring companies, and contemporary music performances all throughout the 1980’s. Ian McDiarmid and Jonathan Kent took over as artistic directors in 1990, and the focus of the theatre moved more towards works and revivals by major playwrights, including a string of successful Pinter productions (Betrayal in 1991, No Man’s Land in 1992, and the premiere of Moonlight in 1993). In 1993, the theatre won the Olivier Award for Outstanding Achievement in an Affiliate Theatre. After receiving £1.5 million by the Arts Council (and an additional £5.8 million from the National Lottery), the theatre closed in 2001 for essential repairs and restoration. During this time, the company moved to a converted bus station and Michael Attenborough took over as artistic director. The theatre finally reopened in May 2003 with a production of The Lady from the Sea. The theatre currently hosts both classic and new plays staged to extremely high standards.